A urethral blockage usually results in your cat lying around the house, even more than normal. Crystals and stones and mucus, oh my! What might seem like a strange spin on Dorothy's quote from "The Wizard of Oz" actually is what could sum up your kitty's urethral blockage. Even a partially blocked urethra is no laughing matter, but your feline can make a full recovery. 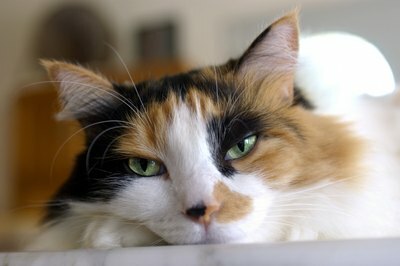 Your kitty's urethra likely can lay the blame for obstructions on plugs and bladder stones. Tiny stones form thanks to mineral deposits in your kitty's bladder. Mucus, crystals, cells and protein can form plugs. While stones and plugs are comprised of different material, they essentially do the same thing in blocking your cat's urethra. The stone or plug slides down into the urethra and doesn't get pushed out, because it's larger than the urethra opening. If you have a female cat, consider yourself lucky -- they don't suffer from these annoying stones and plugs nearly as often as males. Males have a thinner urethra, so they're out of luck. The first symptom that a stone or plug hasn't made its way out is your cat's inability to urinate properly. Instead of hopping into the litter box and doing his business as usual, he'll strain, pee only a tiny amount and then exit the box, only to begin the whole cycle over again in a few minutes. His abdominal area also may hurt when you touch it, and he might even meow when he pees because he's in pain. The stone or plug sometimes will move slightly, allowing more or less urine to pass through until it moves again. Sometimes it breaks apart into tiny pieces, and those pieces act as separate stones or plugs that can get stuck in the urethra or be passed on through into your kitty's litter. If your cat can't pee at all, his urethra is blocked completely and he'll probably cry out, pant and appear lethargic. At that point, you need to pack your stuff and get to your vet or an animal hospital right away. An untreated urinary obstruction can be fatal. Your vet unfortunately is not a superhero with x-ray vision, so he'll have to stand your kitty in front of an x-ray machine to determine whether a stone or plug has made its way into your feline's urethra. If an x-ray doesn't show anything, an ultrasound may be in order. Your vet might be able to pinpoint a cause with a urinalysis. In some cases, your cat's diet can be the culprit, while some cats are just genetically predisposed to painful blockages. However, plugs and stones sometimes can be enigmas, with no clear answer as to what caused them. It's time to deliver some good news and bad news to your lovable kitty. The good news is his wonderful vet can make the stone or plug a distant memory. The bad news is that sometimes surgery is needed to do so. Depending on the severity of the situation, your vet might try medication first to try and push the plug or stone through. If that's not an option, he'll likely have to go in and remove the stubborn object himself. After the stone or plug is history, increasing the size of the urethra is an option so that your kitty doesn't have to go through the agonizing process again. Although stones and plugs are the likely offenders of a urethral blockage, it's possible that scar tissue, a tumor or even blood clot could be acting as a stopper and blocking his urine flow. This is all impossible to know without performing tests, so that's just one more reason to make a trip to your vet's office and never wait out your kitty's peeing problems.